Below is a look at Dan Weseman’s 3.3 liter Corvair being prepared for installation on the Panther prototype. This engine was dynamometer tested with impressive results. 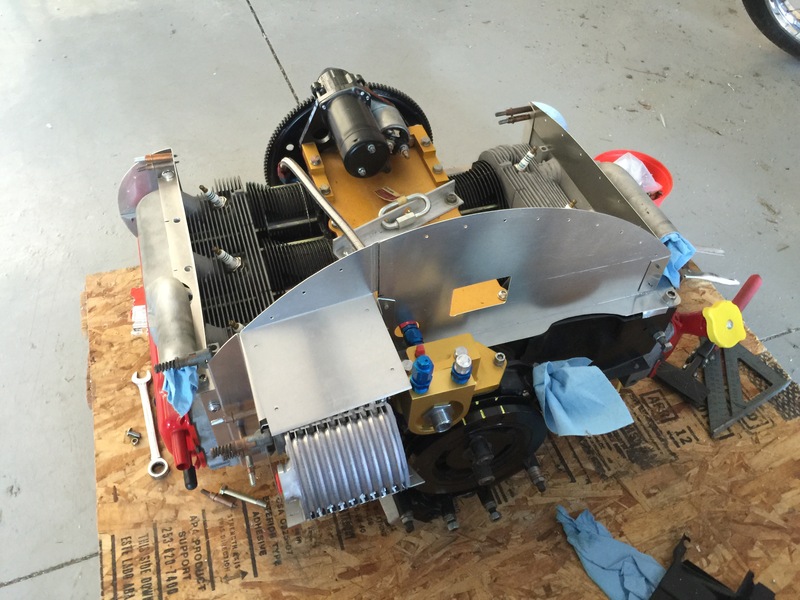 The prototype ‘s original 3.0 liter engine is migrating to Paul Salter’s new Panther, which is just coming back from the paint shop, and will be completed and at Oshkosh. Paul’s airframe will be the 8th Panther to fly. Above, the Wesemans make perfect baffling kits for many different Corvair powered airframes. Their most popular sets are for zeniths, Panthers and Cleanexs , but they have also made them for planes like the Bearhawk LSA. Every part it perfectly shaped, formed and comes with all the holes drilled. They are matched hole tooled, and fit the nosebowls perfectly, no trimming required. The parts shown above can be put on the engine in 30 minutes, it takes about an hour to install the silicone rubber seal strips. The kit not only provides a clean quick installation. It has excellent cooling. This type of cooling is on 95% of successful air cooled planes like RV’s and Cessna’s because it works. Look up the concept of a ‘plenum chamber’ and it says a large volume of pressurized air in a container designed to allow the air to slow down and have the pressure equalize. The system above does this task better than a set of ducts because it has much greater volume, and that means the airflow will slow down and minimize currents and inertia that can cause the air to flow unequally through different parts of the cooling fins. Picture a white water river and a broad slow moving river that are flowing the same gallon per hour rate. The fast moving white water will have eddies and currents and pockets behind obstructions vs the slow moving flow bathes each obstruction equally, flowing smoothly and completely around it. That is the very idea of a ‘plenum chamber’ and a low volume ‘plenum’ without the chamber doesn’t do the same job. This is a good angle to see that this system doesn’t have a ‘choke point’ above the front cylinders. It has a very large crossectional area there to slow the flow down and not form a restriction. Look at how easy getting at the spark plugs is, and nothing has to be removed to perform a compression test to inspect the top of the engine or head gasket area. Above, having the starter on the front allows the oil filter to ride back on the engine instead of remotely mounted on the firewall. 17 years ago I pioneered mounting the filter on the firewall and using rear starters, but was open minded enough to revert to improved front starter systems and gold oil filter housings because they work better for builders. More than 90% of Corvair powered planes are configured this way for a reason: it works. For the same reason a large volume plenum works for the engine , the oil cooler works vastly better directly fed by the air in the plenum addressing the whole face of the cooler rather than being fed a current down a hose. Pictured above is a 9 row cooler. This is the same size and installation I built for Andy Elliot’s zenith that flew more than 600 hours without issue in the Arizona desert. It works. Having the cooler on the engine keeps the hoses shorter and they move together with the engine and cooler as a unit, not flexing in operation. The rear view shows how high the rear baffle is on a panther. This is a good thing, it adds to the volume in the ‘plenum chamber’ of air above the motor. Some humans may like the look of ducts, but the air flowing through the motor doesn’t care that the inside of the cowling is forming the top of the ‘plenum chamber’ it is using. Air doesn’t have an ego, and it isn’t attached to defending something it thought up nor does air have feelings that got hurt because someone was ‘rude’ to it. Air just works to cool things in proven systems. It’s just physics. Joe, Dan built the engine and paid for the tests, so I will let him reveal the numbers at Oshkosh instead of letting the cat out of the bag, but let it suffice to say they are good. You Are right and I will wait. Cool place to announce. “Air doesn’t have an ego” I love your dig at the “experts” and naysayers !!! I have the same baffle/ oil system set up on the 3L in the Merlin. Your stuff works period. Another thing poeple sometimes miss is that the recommended method and the generous height above cyclinders, allows the fast moving air to make the ‘gentlest’ turn possible, i.e. more gradually than thin plenums practically strapped to the surface, which would require sharp turns to head in the proper direction. That air has inertia and it doesn’t like sharp turns anymore than a rushing river, and the energy has to go somewhere. Often it goes into making you slower, or providing you with a ‘problem’ to solve. Hope the rest of the tour goes well. Stay thirsty my friends. William, you are a hoot! As with anything else in flying, SMOOTH wins. In our cars the engine shroud along with the blower fan creates the exact same process (a pressure chamber). The top of the shroud above the cylinders, about 5 inches distant, creates a volume of air being forced in a centrifugal way outward from the center of the engine. GM engineering knew that individual tubes or channels is not as effective than a volume pressure chamber. If plenum tubes were a better system they would have engineered it that way. In the aircraft cooling is vastly improved simply because of the tremendous cooling volume available if the same principle is used. I really have to wonder why I have heard many times the statement at fly in’s in front of aircraft flying with converted Corvair engines “the original blower should be used” or similar. It baffles me (pun intended) how anyone could miss the very large fan mounted in front of the engine called a propeller. I also mentioned to one person that said this that I have never driven my 1965 Corvair car at 160 mph and most certainly not at 10,500+ foot elevations..but there are several aircraft fully capable of that performance or more with the same basic engine installed. I’ll have to remember the “egoless air” reference. That was a good one William! grins. Two aircraft that use plenums: BD-5J intake, Harrier exhaust ducting. With all that baffling on the engine and the lower cylinder baffles still in place, where the all the air end up going? Why is the oil cooler mounted where it is to catch nothing but hot air off the cylinders? Perhaps you just phrased that funny, but It came across as a statement that you know where air that has heated by the cylinders is going. In reality, all the air heated by the cylinders is passing out of the bottom of the engine, and none of it passes the cooler. 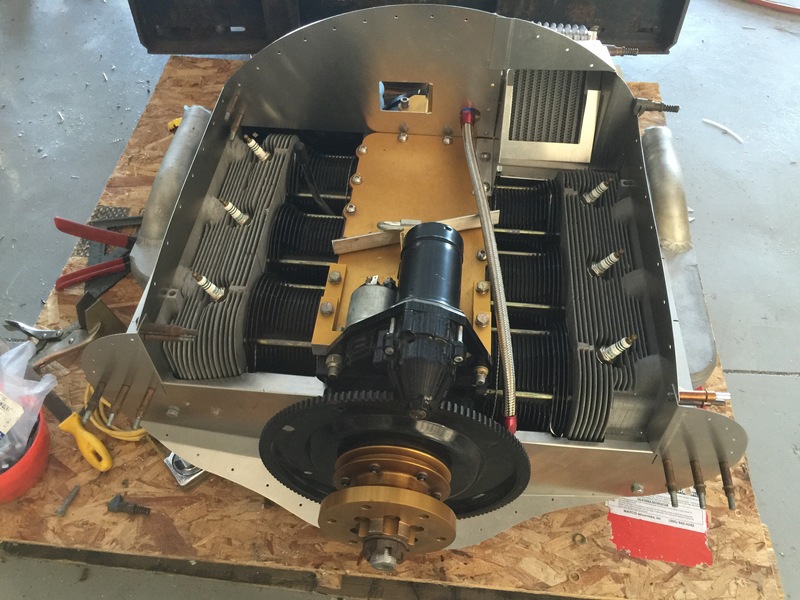 The whole top of the motor, including the cooler, is bathed in a continuous supply of fresh cool air. There is a baffle between the #2 cylinder and the cooler that prevents any radiant heat from reaching the cooler. In the last 20 years, I have tested all types of cooler on the Corvair, in many different locations on the engine, and by far, this is the best location, vastly better than feeding it with a hose or naca duct. Coolers work on pressure differential, exposed face area, and the volume of the plenum they are directly adjacent to. But let me offer this simple proof: the set up pictured has been flying on the Panther doing hard aerobatics for years, so maybe I’m not that stupid. -ww.